I have his little monitor right near me as I listen for any sound coming from his room. We are having a ball...but, I have to tell you...it is exhausting! He is very energetic and loves to play...so, Grammie is right there playing along. He jumps up and down...I jump up and down. He runs around the room giggling....I run around the room with him. He dances to the music that I play...I dance to the music. The wheels on the bus go 'round, 'round, 'round...and we go 'round, 'round, 'round. He loves getting slightly dizzy...I am slightly nauseous!! I am so amazed at how much he has changed since I last saw him Thanksgiving! He is saying more words (no "Grammie" yet...but, we are working on it!) and mimics every word that he hears. Some of his favorite words are "more" and, of course, "no!". I am fascinated by his patience as he drops items into a container, shakes them out...and drops them in again and again. I was in heaven as he sat on my lap and allowed me to read stories to him. He especially loves the books where you can feel the different textures and/or push things to make noises. ...I am thinking that maybe Grammie should take a little nap now, too. My plane leaves for freezing MN in a couple of hours....I have on my short underwear, my medium underwear and my LONG underwear (!! 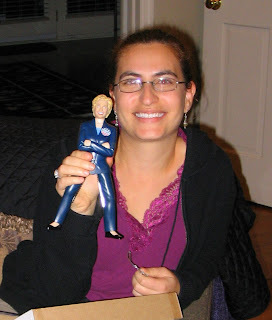 ).....but, I didn't want the day to get by without wishing my daugher-in-law, Janet, the happiest of birthdays!! I love and miss you!!! 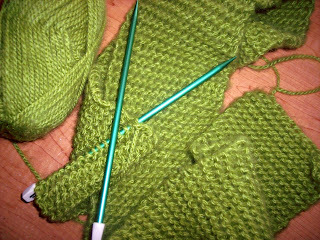 I am just about finished knitting this warm scarf to take to Minneapolis tomorrow. And, from the latest weather reports, I will need it! It keeps changing, but right now they are predicting mostly cloudy skies and a high of 6 and a low of minus 4. 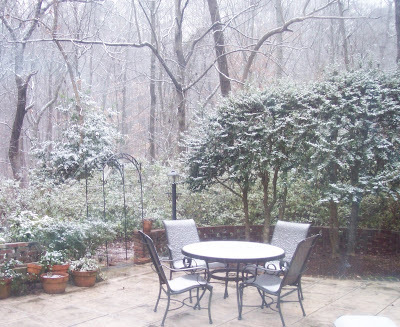 It sounds like teeth chattering weather to me as I sit here in Birmingham where it is a balmy 64 degrees today. But, like the postman..."neither rain nor sleet nor dark of day shall keep me from my appointed rounds seeing my OWEN! ...more to come as Grammie takes on Minneapolis! I have gathered together every warm item of clothing that I own. The key is layering...and, layered I shall be! I have some borrowed things from one of my sister...hats, scarves, gloves, underwear, turtlenecks, down jacket....and, even a beautiful leather swing coat with a fur trim. When I put it on my whole demeanor changes and I suddenly feel like a movie star struttin' her stuff! The latest temperatures out of Minneapolis are still in the minus column with even a few snow showers thrown in for good measure. But, the excitement of seeing Adam, Jenny, and (of course!) OWEN is filling me with all the warmth that I will need. My dad started out earlier last week with bronchitis and is now in the hospital with pneumonia. He went in last night after he became increasingly lethargic and dehydrated. Although he was very (did I mention "very"?!) resistant to going to the hospital, I think that, after all was said and done....he was actually quite relieved to find out the reason behind his feeling so poorly these last few days. I know that my mom is happy to see him getting the proper care now as she has been quite worried and anxious over this whole thing. And, rightly so. The good news is that right now he is sitting up in his hospital bed enjoying a hamburger while visiting with Mom and my two sisters who live down there. I even got word that he has been flirting with some of the nurses! Sending healing love and hugs your way....! P.F. Changs was the restaurant where Dave and I had our first date five years ago....so, it just made sense to go there to celebrate our "anniversary". Well, I must say that the dinner was delicious...the conversation flowed....and we really had a lovely evening out together....five years older and wiser....with emphasis on the "older". The very young (maybe 18 years old?!) waitress thought that we were such a "cute older couple" as we related our story to her. Today marks the anniversary of my very first date with Dave five years ago. Here's to many more, sweetie! I live in the Deep South....so, why am I buying long underwear, scarves, and gloves right now? I went to Target (my favorite place!) to see what they had on sale that would keep me warm as I prepare to head to chilly frigid Minneapolis next week!! I leave on Wednesday to see my son and his wife and.....OWEN!!!!! The headlines should read: "Grammie braves the cold to see grandson!!" or more appropriate: "Grammie heads to Minnesota....Is she nuts??"! Luckily, the winter wear at Target was drastically reduced and I was able to purchase several items all for under $10 total. I guess that there isn't really much need for long underwear here in Alabama! It was nice and relaxing here at my home this past weekend. And....it may prove to be the "calm before the storm" as things start to pick up in the next few months. The nice thing is that they are all happy things ahead... starting with this coming weekend. Some of my dear friends are throwing a little "5 years together" Anniversary party for me and Dave. I am so touched that they are sharing in our celebration and joy. Most of them are celebrating marriages that go as long as 30+ years....and yet, they are marking this event for us with such love. Dave and I are so appreciative. Looking back on the last five years since first meeting Dave, it is amazing how far we have both come. When we met, I was still "bruised" from my 31 year marriage ending-- resulting in my divorce a year before, having dated a multitude (!) of men in the previous months. They call that first year your "crazy time"....and, it certainly was for me! Dave, too, was "licking his wounds" from a long term relationship that had just ended for him. So, there we were, two "lost souls" about to embark on a five year odyssey that neither of us were probably prepared for. Dating in one's 50's takes on a whole new attitude. You have pretty much defined "who" you are by then...and, most habits and preferences are fully developed at this point. Instead of "growing up together" ...it is more like finding the patience necessary to accept who the other person has "become" in their 50+ years of life and appreciating and understanding how they got there. This acceptance is necessary in order to allow the relationship to develop, grow and hopefully, thrive. This is not always easy and "growing pains" are certainly part of the process and will continue to be as we learn more and more about each other. The sand trucks were mobilized. The local news went on all night long constantly updating the latest weather and looking for any sightings of the first snowflake. Grocery store managers were smiling as people flocked in yesterday to stock up on bread and milk. Dave brought over some packets of hot cocoa to be sipped by the fire as the snow fell outside. Ahhhh.. The television continued to flash the latest radar as we all watched in anticipation and excitement. 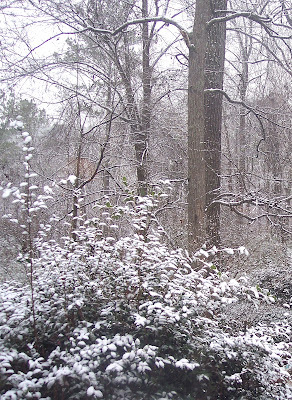 We all went to sleep last night hoping to awaken to a postcard snow scene. 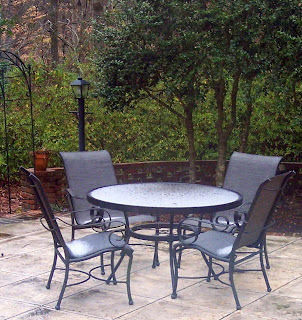 If you look really closely at the picture taken in my backyard this morning, you might see the slight dusting of some of the white stuff on my outdoor chairs and table top. 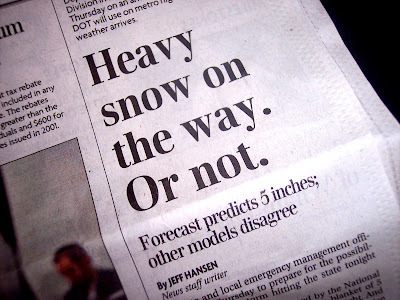 The great "Snowstorm of 2008" was a bust. Well, shortly after posting the above, we actually did get some snow. You Northerners would call it "laughable"...but for us down in the deep South...this was a snowball throwing, snowman building, and snow angel making event. ...for a little while, anyway. It is supposed to snow. But to the grocery we Southerner's go. why we do it before it's a go. Will it be cold rain....or will it snow? The weatherman tells this tale of woe. and sit and wait for a little snow. we may see some falling snow. and blanket Birmingham with some lovely snow. One of my good friends just had a little health "scare". Her lab reports kept coming back with an irregularity that needed to be checked out...so, today she went to a specialist. We both breathed a sigh of relief as the news was good...nothing to worry about. I watched her mood change immediately as she now had that familiar "lilt" to her voice. Hearing a good health report makes one feel as though a huge weight has been lifted...all feels well with the world...and we are lighter from the lack of anxiety and concern. If I was ever given the opportunity to choose just one wish to come true (you know....like a Genie would suddenly appear!? )...my wish would be for good health. WHO ARE ALL OF THESE PEOPLE AND WHAT ARE THEY DOING???? It is the return of American Idol !!!! Last night was the beginning of the much anticipated Season 7 of American Idol. Well, much anticipated by me, of course....the "Grammie Idol Groupie". I guess that it all stems from my love of people watching....and this is the ideal venue for that...even though I must admit that these "off the wall" auditions aren't really my favorite part of the Show. Sometimes they leaving me feeling a little sad, especially for the people who really believe that they have talent and, obviously don't...or the people that feel the need to come in ridiculous outfits or nutty persona's just to be "seen". What I really love about Idol is when the truly talented and undiscovered person comes through and succeeds....that's the real entertainment. and, finally a "Paula Stalker" singing: “If you were a blackboard, I would chalk you” and “If you were a bath tub, I would caulk you, if you were a dog, I would walk you...etc. etc.” Puleeze! Here are some photos of Owen while visiting a "hands on" museum in St. Louis...He's getting to be such a big boy! ...not to worry....it's just a play oven! ...and, building with giant legos and daddy! Dave decided to make me dinner Saturday night. While I usually do the majority of the cooking when he is over, he is a wonderful cook and has contributed to the meal many times. So, I poured myself a glass of wine...turned on the television in the den....put my feet up on the couch....and relaxed while he scurried about in the kitchen. Ahhhh. He closed off the kitchen and told me that I couldn't come in until the meal was prepared. One of Dave's pet peeves with my cooking is that I don't clean as I go. Pots, pans, bowls, spices, etc. are everywhere when I am finished preparing my meal. That is not the case with him. As I walked into the kitchen I couldn't even tell that anything had just gone on in there with the exception of the wonderful smells that were in the air from the newly prepared meal. It was spotless! Impressive, eh? Well, the meal was yummy...fresh shrimp with a light and lovely orange/honey sauce, fresh green beans with sauteed mushrooms, and herbed potato wedges! I did everything but lick the plate...it was so good. As if that weren't enough...the next morning he asked me what I wanted for breakfast. Now, this isn't usual for him as I tend to be the breakfast maker most of the time. But, again, who was I to take away this man's pleasure?... so I quickly agreed. I put my order in: a fluffy egg-white omelet with a sprinkling of fat-free cheddar cheese on top, some creamy grits topped with a few shrimp (I was on a roll! ), and a piece of whole wheat toast. Twenty minutes later I entered the kitchen to snorf down leisurely enjoy my delicious breakfast. You know....a girl could really get used to this! I wonder what's on the menu for next weekend??? 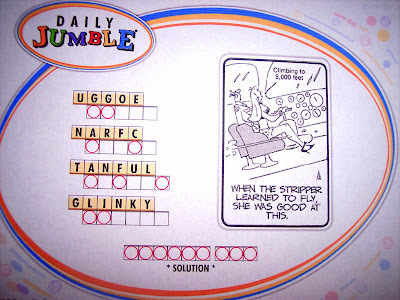 Have you have your "Jumble" today? Here's a little secret: you can ask for a hint online when you are really stumped. I try not to do that too often, but it has helped keep my frustration level to a manageable point at times. Think that you can do it? I am woman, hear me roar!? I have not made up my mind yet regarding the Presidential election this year. That being said, I have been quite dismayed by the treatment that a certain female candidate has been given by the press so far. Even though I try to stay away from politics on my blog, I felt the need to express my opinion today about this matter. This cartoon was on the editorial page of the newspaper today. 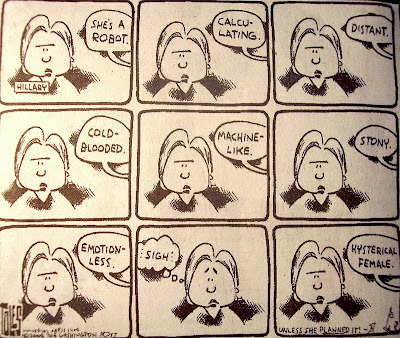 It portrays much of what I feel has been going on with Hillary Clinton. Love her or hate her, she can't seem to "win" when it comes to how people view her. If she comes across strong, she is called "emotionless" and "distant". Yet, the minute that she feels some emotion and allows us to see her vulnerability....she is slammed for being a "hysterical female"! No male candidate would ever be under such intense scrutiny for showing/not showing his emotions! C'mon people!! We sometimes forget that these public servants are mere human beings...they are generally quite passionate about what they believe in..and, behind this passion are some strong emotions. I think that it is time to look beyond personalities and begin to scrutinize the issues that these candidates are espousing. We need to educate ourselves as we concentrate on those things that we believe in...those things that are needing change....those things that will be important to our children and their children in the future...and to seek the candidates who have the strength necessary to lead us in the right direction. "Hey guys...how about this pair?" "I wonder if they have these cool yellow ones in my size???" "I know the drill.....I lift my leg and you put the shoe on..."
"Truthfully, I'd rather play with Poppie and this balloon!" My little Owen is growing up!!!!! A friend recently asked me for a recipe. I went home and tore apart looked through all of my personal recipe books trying to find the one she wanted. When I couldn't find it there, I began to go through the stacks of recipes that I have crammed put into large zip lock bags for later organizing. These are mostly pages from my cooking magazines that looked interesting to me...or typed and printed out recipes from the computer. It is really ridiculous as I go through sheet after sheet on this recipe search. My plan is to try and do some major organizing around the house starting with these stacks of recipes. As I was tearing through a new package of "Greek Isle Pita Chips" while leaving the grocery store today, I felt such a sense of delight. The temperatures had risen to the high 60's and the sun was shining. There was a gentle breeze. I smiled as I watched the shoppers enjoying these higher than normal temperature. I got home, put the groceries away and went for my walk. Along the way, I spotted my friend Cathy sitting in her yard enjoying the weather as well as one of her adorable granddaughters. I sat and visited with them for a bit...feeling a bit envious that she has all of her children and grandchildren living here in Birmingham...but, thoroughly enjoying my time with them. Dave had gone home earlier to spend some time in his own house taking care of things that had been long-neglected. He was also having to lick his wounds as his beloved Pittsburgh Steelers went down in defeat last night during the wildcard playoffs. Suddenly, he received a phone call from his family in Delaware. His mom, who had been bedridden for several days with what seemed like a case of bronchitis, had been taken to the hospital where she was diagnosed, and admitted, with double pneumonia. Suddenly, the rest of the day paled in comparison to this latest grim news. We await more news from Delaware as she is being cared for and treated with the necessary meds. We will certainly have her in our prayers tonight. 2. Read more books and less magazines. 3. Attempt (again) to seriously learn signing for the deaf. 6. Add some other exercises to my morning walking routine. 7. Stop trying to "save the world from sadness". 8. Do a better job in my backyard gardening come springtime. 9. Entertain friends more often. 10. Treat myself to some pampering now and then. 11. Do more small random kindnesses for people that I don't know. 12. Stay in touch with out of town friends on a more regular basis. 13. Try not to take things personally. 15. Do something that is out of my comfort zone. 16. Increase my pottery income. 17. Be better organized with my paperwork. 18. Spend more time just "being". 19. Learn how to meditate. 20. Take time off from being a caretaker. 21. Continue to visit family every chance that I get. 22. Learn more about the people running our government. 23. Only go to the grocery store once a week and follow a budget. 24. Learn to bake homemade breads from scratch. A New Year's Letter to Baby-to-Be "Moe"
Well, here it is, 2008...which will be the year of your birth. To say that we are all anxiously awaiting your arrival would be quite an understatement! You are coming in a year filled with so many special family celebrations: a great aunt's 55th birthday, Grammie and Uncle Dave's 60th birthdays, Great grandpa's 90th birthday (!! )...your uncle's wedding, a great aunt and uncle's 25th Wedding Anniversary...etc. etc. 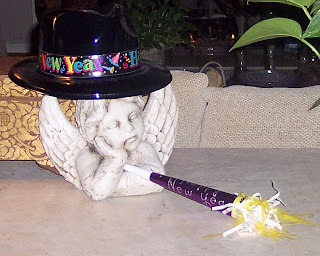 What a wonderfully joyous year we all have ahead of us. I am not sure what to tell you as far as the world that you will be coming into this year. Politics are the big news right now as we will be electing a new leader this year. It may be a historical Presidential election in that we have an African-American as well as a woman running as possible candidates. Of course, in my opinion...that diversity in our government leaders is long overdue. Unfortunately, the war in Iraq is still going on. Too many lives have been lost....too many dollars have been spent. I pray that as you grow up you will never need to understand or participate in a war of any kind. I wish for you a world of Peace...and that the money spent on wars now will be used to find cures for cancer, as well as so many other diseases in your lifetime. You will be inheriting a world where taking care of the environment will become more and more important. You will want to leave it a better place for your grandchildren...just as I do for mine. 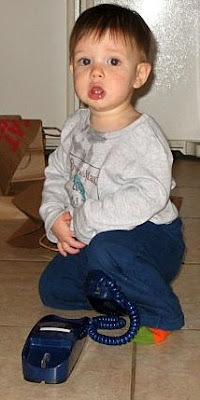 Being a second child, you will probably learn quickly that you will be entering into your brother, Owen's little world. Since he got here first, he will be able to teach you so much...and I just know that the two of you will get to be great friends. Your daddy-to-be and his brother, your uncle-to-be Jeffrey, had a wonderful time growing up together and remain so close to this day...it makes me smile thinking about it. 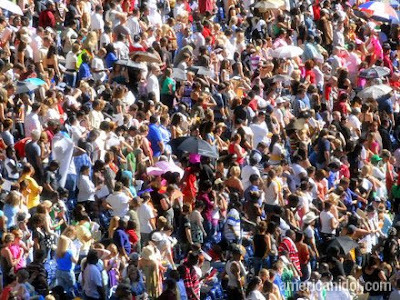 You will have so many people who love you...even though we all live quite far away, we will manage to get as many visits in as we can! We have found through being with precious Owen, that we want to spend as much time with him as we possibly can. I call it getting my "Owen Fix"! The changes that occur month to month seem to happen so incredibly fast....and, while it is difficult to not see him every day...we appreciate the times that we are together as we celebrate his new skills and activities. With your arrival in June there will be two very good reasons to travel even more in 2008! Such fun! So, as I sit here thinking about the year ahead...I can't wait to welcome you into the world...hold you in my arms...look at your sweet face....and begin to love you. And, when she was good she was very very good. The above quote is from a well-known nursery rhyme. Today, it applies to my computer...!!! When it is good, it is very, very good....but when it isn't working--it is horrid! After spending most of the morning trying to resolve the issue....I have decided to let it go for now and get some other things done. 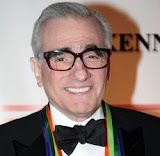 We didn't ring in the New Year with just anyone this year.....we were honored with the presence of Academy Award winning director Martin Scorsese. This is just my wonderful friend, Gary, with his new glasses! My friend, Sharon (his wife) decided that he looked very much like the famous director so we teased him unmercifully the entire evening! 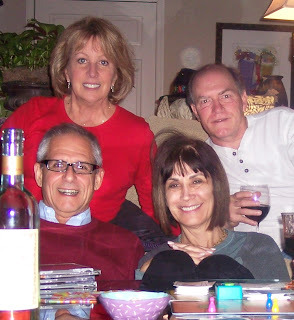 The fun part was playing board games while imbibing adult beverages and devouring hors d'eurves...Gary brought two unmarked bottles of Merlot wine....One was on sale at Whole Foods for a ridiculously low price of under $5....the other was a more expensive bottle of the same type of wine. Well, we both selected the bargain wine as the more expensive one...which just goes to show you that you can't always go by price when it comes to wine. Or, it shows that Dave and I have absolutely no idea what a more pricey wine tastes like! Anyway, we had a lovely dinner of pita-wrapped salmon filets with lemon-garlic aeoli and julienne veggies inside, brown and wild rice mixture and my friend, Ellen's famous cold broccoli salad. A bottle of champagne was opened during dinner as we all toasted friendship and a healthy and happy 2008! The record that was broken was that Sharon never makes it up very late but this year she was still around at 11:47 p.m.
Sharon pointing to the digital clock to prove that she was up at 11:47!